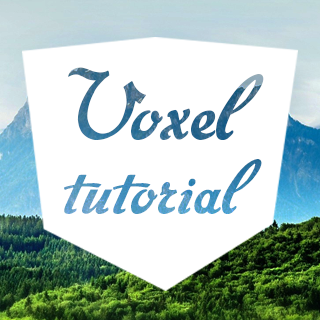 You may have noticed how I cleverly named the last part 3d voxel and this one 3d voxels. That it because in this part we'll be making our chunk show an actual chunk of blocks. So picking up from last tile where we had one block rendering what we'll do now is make a way to store the information of the chunk. This is an interesting point because there are two ways to do this, you can store the information in each chunk so that every chunk has the data for the blocks it contains or you can use a big array for all the level data that each chunk refers to. I think we'll use the big array because it's easier later on. This will mean that our world has a fixed size though but making an infinitely generating world will have to remain outside of the scope of this tutorial. With the default variables our world is only one chunk in size but we'll change that later. This array is pretty useless when it's all empty so let's at least fill it with some placeholder data, similar to how we filled the 2d array we'll cycle through all the dimensions of this array and turn anything lower than 8 to stone. Remember that in our data array 0 is air, 1 is stone and 2 is dirt. Later on we'll use this script to also generate all our chunk game objects but for now we're just going to use it to store the data while we finish setting up the chunk script so we'll jump back to that chunk script. Go ahead and add a new public variable to the chunk for the world object and a private one for the world script. This is temporary so that we can access the world data. Now in the chunk script we'll use world.block(0,0,0) to get block data. This function just returns the data from the array but it includes an if to check that the requested block is within the boundaries of the array and otherwise it returns stone. Now this will cycle through every block in the chunk, if the block is not air it will run through all the faces of the block and check adjacent blocks. For each adjacent air block it will create a face for that side. We just check if the block at x,y,z + 1 in whatever direction we're checking is air and if so we run the function for that face. At the end of the function we call UpdateMesh() to set the mesh to the new one. If you run now you should get a flat mesh showing the tops of 16x16 blocks. So this is pretty cool, it's terrain with a collision mesh and you can update it at any time by calling GenerateMesh(); You can also change the creation of the data array contents to get something more interesting than a plane. 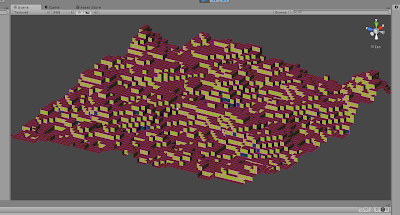 The problem here is that we've written the code so far just to make this one chunk but ideally we would have lots of chunks for more advanced terrain. Why don't we do that now. 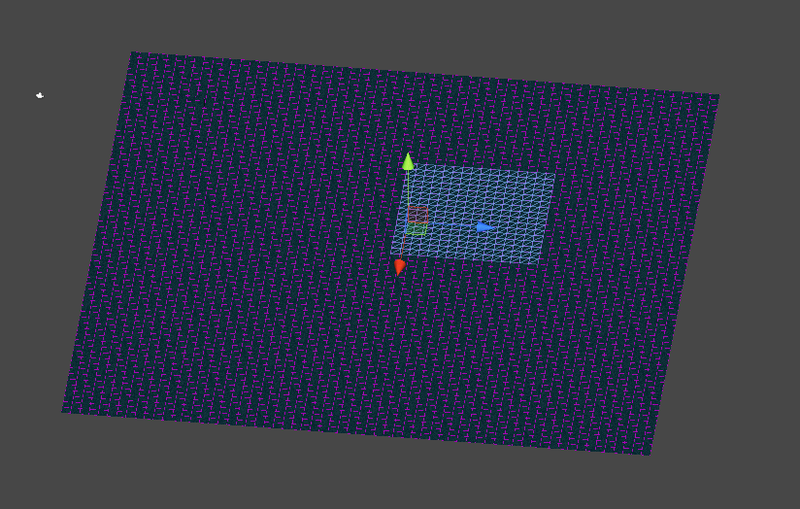 What we'll do is just use the world gameobject for initialization and it will generate the chunk gameobjects as needed. Take your chunk gameobject in unity and drag it into the project window (into a prefabs folder if you want to keep it neat) and this will make a prefab of it. Now you can delete it from the scene. Switch to the world script and we can get going. 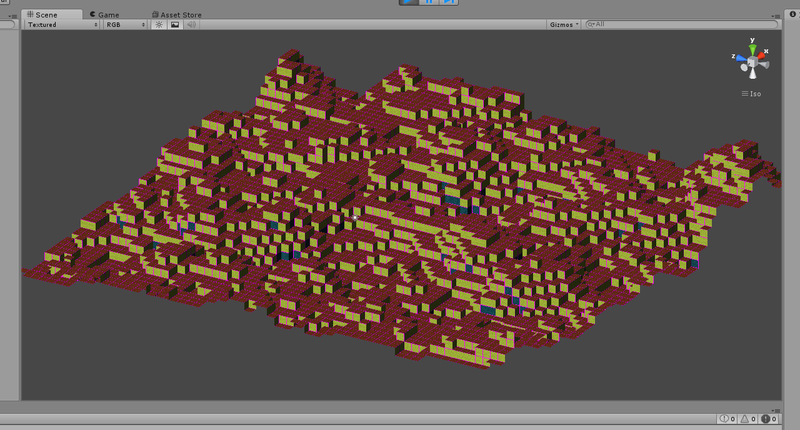 And go into unity and set the chunk gameobject to be the prefab we just created. What this does is generate enough chunks to display the contents of the data array and then sets them up with the variables needed. First we initialize the chunks array taking the size of the level and dividing each dimension by the chunk size so that we get the right amount of chunks based on the size of our world and we turn them into ints rounding down so that if they don't match up we get fewer chunks rather than chunks that aren't filled. This means that we never have to define how many chunks we want instead we just define the size of the level and the size of the chunks to represent them. Then we go through and for each slot in the chunks array we instantiate a new chunk prefab. They are positioned with a new one every chunksize so we get their position with dimension*chunksize. Then we get access to their Chunk script and then set some variables. The worldGO, the chunk size and then some new variables; the coordinates of the chunk so that it can know which blocks it represents. Go into the chunk script because we have to make some changes here too. Add these new variables for the position that we'll use to access the right blocks from the data array. All this does is add on the position of the chunk to the position of the block we're accessing so that the chunk further to the center of the level accesses the blocks at it's location. To use this function we have to change the way we accessed the blocks before so find are replace occurrences of world.Block with just Block. However don't replace the one in the function we just added. return world.Block(x+chunkX,y+chunkY,z+chunkZ); // Don't replace the world.Block in this line! So you can either click replace for each instance and skip the one return line we want to keep or you can replace all then remember to change back that one line. Now we can set the size of the world in the world object and leave the chunk size at 16. If you set the size of the world to 64x64 it should generate 4x4 chunks! But the problem now is that this terrain is super boring, why don't we fix that? To the World Script! This is very similar to the way we added noise to the 2d level, we'll be generating perlin noise for each column. Then after that paste in the code from simplex noise implementation linked as Download at the bottom of the post I just linked. Just save this file and we can access it from the World script. Now we can call Perlin noise with some extra variables like scale and height and power like in the 2d version but now we have a whole new dimension. Up in the start function where we created a floor of stone let's replace that with something a little more interesting. This should add a little noise to the surface and in addition add a new block. If you run now the surface should be noisy but everything will be the same block. What you can do now is add different textures for blocks. Back in the chunk script in the code for each face we decided what texture to use but just set it to stone, now let's change that. Now it needs some remove and place block functions and some more block types but you can see how it's done. Next time I think we'll be able to place and remove blocks and come up with a better way to generate the chunks than before the game loads. Here's an example of what you could do with what we've made so far, with some new textures and directional lights it's starting to look professional. Until then though good luck, even with just this I think you have a good start to work from if you feel like you don't want to rely on my tutorial. Feel free to follow me on twitter or g+ and as always of you have a problem please let me know and I'll do my best to fix it. Could you post the error and where you were when it happened so I can try and fix it and the tutorial? The error Mark is complaining about is after setting up GenerateMesh(). GenerateMesh needs the variable "chunkSize" which is set as "public int chunkSize=16;" but later if anyone follows the tutorial will get later, just after the 16x16x16 plane demo. As in last part, if I find any more errors I'll post a comment. TYPO: "Alexander -> Alexandros" Sorry. I didn't see dirt without the code change! Thanks again for the tutorial, I'm learning a lot of interesting techniques. Thanks for pointing this out, changing that line now. Happy to hear you like it! Hi, probably my bad but couldnt find simplex noise link in here, the one i found generates the same terrain. Actually I think I found it thanks to Bob Johnson's quote below. I googled that and came up with this. I believe it is the right link. Thats awesome, now I understand how minecraft can run so fast. Thanks heaps. Wonder if its very hard to add slopes and the such. No problem Jay, glad you like it! I've been adding slopes and special blocks in my own version lately and it's not that hard, the biggest change is checking whether or not to render faces facing the ramp. Great tutorial! Question about the noise. How do you go about randomizing it? Right now the same terrain is generated every time. Got it. Read the Perlin Simplex page. "if you want a different pattern, all you need to do is modify any/all of the values"
I'm currently encountering an issue where the edges of blocks show visible seams. Went through the whole tutorial once and had the issue, and am now doing it in my own manner, and both projects have the issue. I'm using temporary textures from a Minecraft texture pack, and running on an AMD Radeon HD 6850. Any ideas? Should I increase the mesh bounds by a tiny amount? Hey Veovis, what could be happening is that your textures are 'bleeding' from one tile to another. 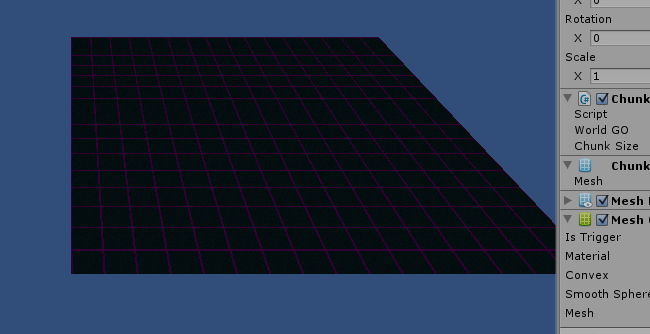 Try setting the import settings for your texture to advanced, then turn off mipmaps and set filter mode to point. This should render the texture without any blur preserving the edge between tiles. Point filtering did it, thank you very much! I think I did that in the 2d project and forgot to redo it in the 3d project. Without the +1 it caused a large portion of the exposed blocks to be stone instead of dirt as in your example image. Also thanks a lot for these tutorials, they were pretty much exactly what I needed to wrap my head around building randomized voxel terrain. Thanks Sark, I changed this in the tutorial. I've used the same values for the Noise you did, and that is what I get. Tiles that doesn't show ! Hey Catalin, it looks like blocks above a certain y are being cut off. This could be because you are not generating enough chunks upwards. The variable that controls this I think is worldY and it's public so you can change it in the editor on the terrain object. Just increase it until your terrain is shown each one is 16 blocks. If they doesn't do it you might need to post your code and I'll take a look. Yep, remember everyone: if you have a public variable that shows in the inspector, the INSPECTOR value will override any changes you make to the variable in code! This bit me more than once. That's strange, I'm on my phone so I can't check the example code but it might be your texture sheet that's the problem. Maybe the side texture is in the place of the top texture and one of the other texture positions is transparent. Try changing the texture coordinates for grass top and see if that helps. Also is there any pattern as to which faces aren't spawning? Maybe it's the rock for example and that texture position variable is set to an empty spot. You could also select the mesh in the editor and see if the wireframe shows a mesh there or not or you could throw on a flat texture and see if they show up. I'll check the example code if this doesn't work. thank you for the reply. The empty space around were I haven't made a texture black so there isn't any transparency. Wire frame isn't generating on the highest level :/ also there is normal stone block being mad as well as grass blocks, there are only a few problematic ones. Then I'll check the example code once I get home this is an interesting glitch and I'd like to take a look. I had the same issue with the top level not generating. I found that it is the same problem T Catalin was having. I increased my World Y on World gameobject in the inspector to 32 and it works after that. Just not sure why it isn't the same as Alex's results. Sorry it took me so long but I've finally gotten a chance to have a look at the example code and I can't seem to replicate the glitch. Try increasing worldY by 16 and see if that helps any of the problems like Ryan suggested but this wouldn't be causing textures to appear on the wrong faces, with the example code I used World X: 128, World Y 32 and World Z 128 and everything rendered fine. If the problem keeps showing up even with the example code and these variables and it's not the texture I don't know what it could be because then we're running the same thing. Maybe if you post a screenshot I could get a better idea of what's going on. I'll post here as well as the comment above, because I wrangled with this longer than I should have. Like me, Jonathan is probably trying to change the values in code instead of in the inspector. Values typed into the inspector override any value in code, even if you try to change the values in code later. You'll either have to make your changes in the inspector or make the code variables private so they can't get overridden. Very nice series of tutorial. I came here to learn how to make a mesh procedurally in Unity and stayed for the rest! Voxels and Perlin noise are cool to make what is probably now known as a "Minecraft" world. I'm curious to know if there are any other techniques for generating worlds, and if you know any by name could you point them out so I can do some more research? Can Perlin noise be used to generate something else than a voxel world? Well Perlin noise can be used for a whole lot, within voxels you could look at marching cubes for an algorithm on voxel smoothing, otherwise you could try using heightmap terrain with Perlin noise which is great for more static worlds. A lot of dungeon generators use random numbers to generate rooms and tunnels between them. You could also get into component based dungeons where you create rooms with doors, then for each door you add another room from a group of rooms to match up to it. Hey Alexandros! great tutorial but I seem to be having some sort of issue, none of the blocks are showing up at all. Nothing is being drawn to the screen at all. The only thing I can see are the little gizmos for the transform in the scene view and nothing appears at all in the game view. I am familiar enough with Unity to mess around with some things and nothing I did fixed it. Thinking I ,must have made a code mistake somewhere I copied and pasted all the code and went through the whole tutorial again :/ unfortunately I still can not get anything to draw on the screen. I am not encountering any errors that the compiler is picking up so I am a bit at a loss for what is wrong. Any help or suggestions would be greatly appreciated! Hmm, there isn't much to go on but if you're not seeing anything of the mesh in the scene view and the game view it must not be getting built so there are a few things that could be happening. First of all check if the gameobject has a mesh renderer and a mesh filter component, if these are missing add them to the chunk prefab. If that wasn't it make sure that your chunk is not empty or completely full, you could replace the terrain generation code with just some simple flat terrain or even just a single block to check this. If it's not that you can check if code is being run for any faces in the mesh building step by printing the faceCount variable at the end of GenerateMesh but before you call UpdateMesh. If that's above zero then the code is being run for the faces otherwise something is happening so that the faces of the blocks aren't being detected. Maybe the solid block and air block checks aren't working or the functions for each face aren't being run. If that's not it either then start checking if the mesh we've generated is being applied. Check that UpdateMesh looks the way it should and that newVertices and the other new* variables aren't empty with newVertices.Count (returns the length of the list, it should be much larger than 0). If these are empty and the facecount wasn't 0 then the functions are being run but nothing is being saved to the new* variables. I'd like to thank you for your great tutorials. Finding them very informative, and well paced. and the next thing you do is find+replace world.Block with Block. This causes the world.Block in the Block function to get replaced to which would lead to a recursion overflow. Oh wow, thanks for pointing this out! I'll add a note in the tutorial to not replace that instance. Maybe this is what happened to me? Because I was getting an error of a stack overflow! I think I will go try this out first and make sure that the correct code is in the World.cs file. Cause that would certainly cause issues. If that fix doesn't work, I will go check out the other things you mentioned Alex, thank you! U mentioned at the beginning of this tutorial that there are two ways to store the chunk data. You chose to save the chunk data in a world array. Im curious as to how to store the information in the chunk. Can you elaborate on this at all Alex? It comes from the Block function, while returning the data[x, y, z]. I ran into this same issue, which is an order-of-operations problem. Both the Chunk script and the World script initialize themselves in their Start() function, but Chunk is depending on World to run first, which is not guaranteed. If Chunk initializes first, it runs its GenerateMesh() function which calls world.Block() which then tries to return the contents of its data array, which is still null. To fix this, simply tell the World script to do its initialization in the Awake() function, which is guaranteed to finish before any Start() functions are called. So in the World script: "void Start()" becomes "void Awake()". Also note this issue disappears in the very next step since chunks are subsequently instantiated by the World object. In the tutorial where you link to the noisegen class on the other site, the file you link to contains a namespace, so if you just copy and paste it doesn't work, you have to remove the namespace. Not sure what is best. Article mentioned it was updated prob whay tutorial dont match exactly. I know it might sound dumb, but in the part with the flat mesh, I was not able to see the mesh at all. hate to be picky, but I have had some errors with the way strings are declared in your awesome tutorial. You put "(\"Chunk\")", but it gives me an error so I had to change it to "("Chunk")" for it to work. Also, when you wrote "rValue=Noise.GetNoise (..." I had to change it to "rValue=Noise.Noise.GetNoise (" to make it work for me. Very very very good tutorial series by the way!!!! I had the same issue, I don't understand why no one else seems to, but I'm glad you solved it and posted here. Hey mate. Nice Tutorial Series. I was making my own voxelengine but couldn't get it as fast as you. All works fine at the moment but i have some question, about something i cant figure out by myself. You have a limited area defined by the worldsize. The big thing there is, that you are not spawning chunks into minus coordinates and if you reachs the end of the worldsize, it wont spawn chunks either. Is there a way to completly ignore this and always spawn chunks? I have a little problem. For some reason all the hills etc are streched weirdly. Their are all really long in the X direction, but totally fine in the Z direction. I don´t know why. Apparantly I haven´t understood Perlin Noise yet properly. I have been reading over both my code and your tutorial but I am unable to figure out what I did wrong that is causing this error. Can you help me out? I can't believe I did that, thank you so much I have been racking my brain staring at my code for the past 3 days trying to figure that out. 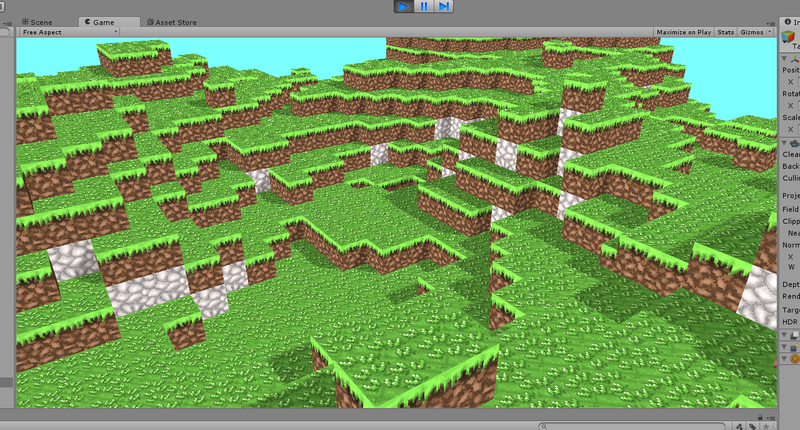 I guess I over looked the part about setting the chunk variable in the world gameobject. I feel so dumb, thanks again. Thought I'd post that I was getting a null reference exception every time world.Block(x,y,z) was called, when I first ran through this part of the tutorial; it turned out that Start() in World.cs was being called *after* Start() in Chunk.cs, and so data[,,] wasn't initialized until after the world.Block(x,y,z) call, hence the null reference exception. I changed Start() to Awake() in World.cs, and this seems to have fixed the problem. Figured out my other problem: although CubeTop, CubeBot, etc. were being called properly (after the Start -> Awake fix indicated above), I wasn't seeing any of the cube faces rendered in either the Game or Scene views; as it turns out, I had an extra call to UpdateMesh() at the end of my Start() function in Chunk.cs. Since previous calls to UpdateMesh() at the end of GenerateMesh() delete the current vertices/triangles/etc, this last UpdateMesh() call was generating an empty mesh, and overwriting all the cube tops etc. with empty space. Not sure if you told us somewhere to remove that extra UpdateMesh() call from Start(); figured I'd mention this in case you didn't. I certainly overlooked it! which declares a full namespace and, inside of it, a class, rather than just declaring a static class outright. Thank you for noticing this. Do you know how I could solve this ? withtout the +10 this works fine but there is no stone on the map. So the "holes" are in fact the stone which doesn't render. Thank you, I solved a couple of problems with your help! Oh, apparently, for people who would have problems with collisions, don't try to use big speeds or your objects will pass through the terrain ! Hi Daniel, I think what's causing these errors is that the generated chunks don't have a reference to the world script. Because of this making the function static works for some of the errors because you don't need a reference to access a public static function but this function won't work as a static function unfortunately but we should be able to fix it. So remove the static term from the function and try this. Especially make sure you're using a lowercase w in "world". Next, in the part of the world.cs script where we instantiate chunks and initialize them make sure that you have the line: "newChunkScript.worldGO=gameObject;"
It should be positioned after instantiating the chunk and after this line: " Chunk newChunkScript= chunks[x,y,z].GetComponent("Chunk") as Chunk;"
This line gives each chunk a reference to the world game object and if it's missing it could be the source of your problems however if it's there the problem may be further on. Lastly, in the chunk.cs script in the Start function we set the variable world to the world script using the worldGO variable we set in the world.cs script. That "world" variable is the one that we use to call functions in the world script so if its missing you'll get reference errors so make sure this line is in the Start function: "world=worldGO.GetComponent("World") as World;"
So these are all the steps in setting up chunks with a reference to the world so that they can call the world script's Block function and that's why I'm asking you to make sure they're all correct. If all of them match and it still doesn't work let me know. "Assets/Scripts/Chunk.cs(124,77): error CS0120: An object reference is required to access non-static member `World.Block(int, int, int)'"
"Assets/Scripts/Chunk.cs(124,57): error CS1502: The best overloaded method match for `Chunk.CubeTop(int, int, int, byte)' has some invalid arguments'"
"Assets/Scripts/Chunk.cs(124,57): error CS1503: Argument `#4' cannot convert `object' expression to type `byte'"
These errors are essentially repeated for the next 5 faces. I've searched for help with the errors but none of the answers I've found have been helpful. Basically, the dirt sections are only being drawn along the diagonal blocks, where x is equal to z. I have no idea why. I've been scratching around in this part of the World script to try to figure it out, but to no avail. It appears to be going wrong as part of the else if, where the data byte is being set to 2 if y <= dirt + stone, but I've exhausted my know-how trying to figure it out. Any help would be much appreciated. Thanks again! Where do i put these lines of code? I have done everything in this tutorial, but i dont know where to put these lines of code, and i cant figure it out. I cant continue any further, someone please help? Not sure what is causing the issue, or what I need to do to fix this. I even tried copying the code straight from tutorial, and it still gives same error. These are great even years later. You did awesome on this! Please let me know if you figure it out!